Thank you to everyone for their interest. Both Max and Buddy have found their forever homes. 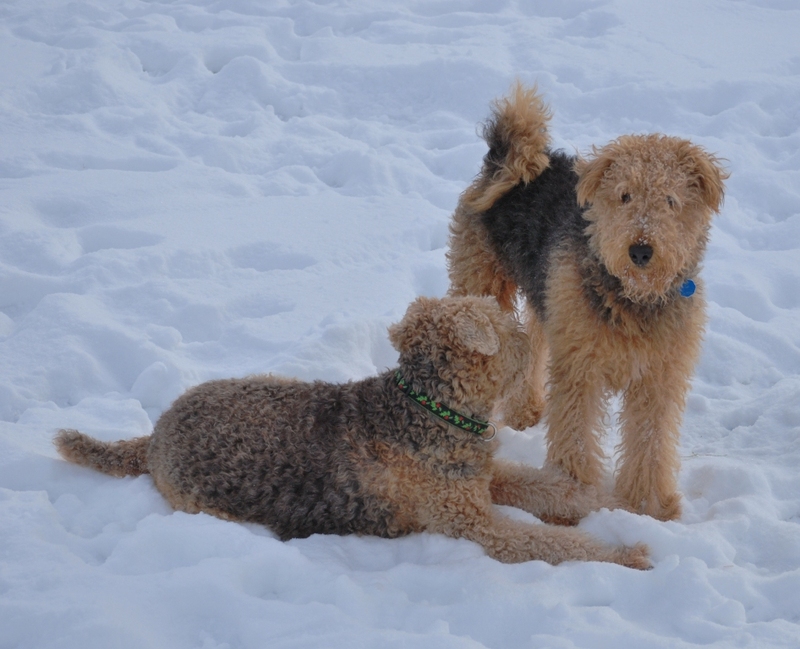 2011 has started with comfy beds and lots of love for two foster Airedales in Ottawa. We have found Buddy a foster home here in Ottawa. On December 31 he was sprung from the shelter and was able to spend a wonderful New Years Eve with his Airedale experienced foster family who might even adopt him if he is a good fit. I am anxiously awaiting news of their first few nights together and hopefully a few pictures. This is exactly what we needed for Bud. Shelters are not good environments for any dog but a dog aggressive terrier in lock up is a bad combination for finding out his true personality. Thank you so much to his foster family for starting Bud’s year off on the right paw! Max did have a pending adoption but was going to be placed as a foster dog with his new family until he could be neutered. He spent one night with the new family but their resident female welsh terrier took offence to Max and was not ready to welcome a new family member. 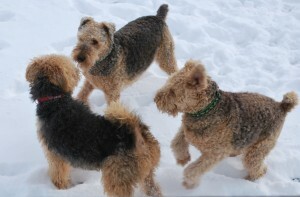 In that one 24 hour period I had the chance to have Max at my home and he met my two female Airedales. He is a very kind and gentle dog who gets along with every dog he meets. What about the Welsh you ask? Well he got along just fine with her but she didn’t like him, however, he never retaliated or acted put off, he just went about his happy business of being an Airedale. Max was placed in foster care on Christmas Eve. His foster family will make sure will be neutered and ready to go to a new home very soon. 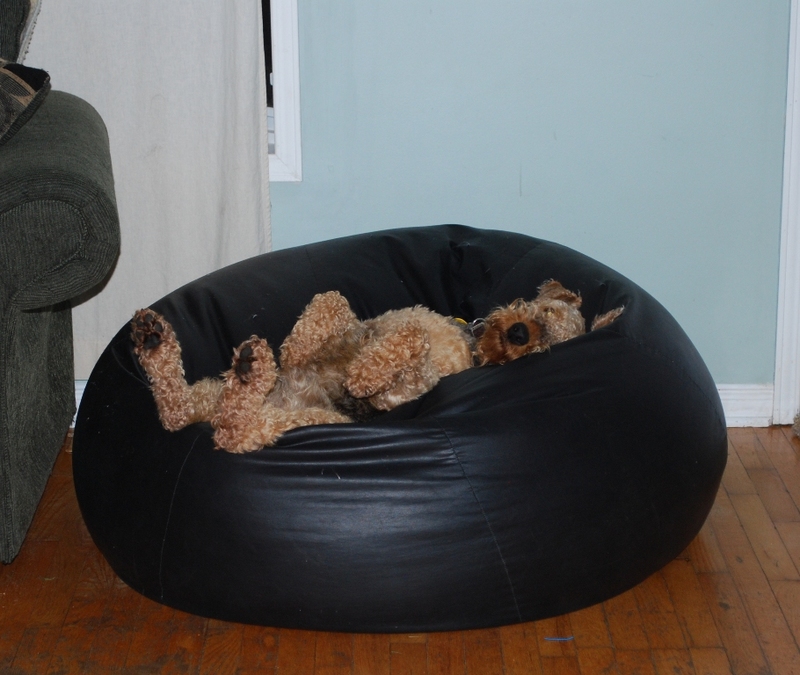 They are writing up a new bio for him and had exclaimed “Are you sure he is an Airedale? He is so good and listens so well!! !” Stay tuned for their post on Max. Oh one other interesting thing about Max is his natural tail. I love it. Check it out in the picture above! Again, please do not ask to adopt Max if you cannot drive to Ottawa. We have had many requests for adoption from one coast to the other and all places sound like very ideal homes for a rescued Airedale, however, we do not fly dogs unless there are very extenuating circumstances. Max is young, cute, cuddly gets along with all dogs he meets, would love a home with another dog. Once he is neutered he will be ready to meet you! Wishing all our 2 legged and 4 legged friends a wonderful and healthy 2011!